This lesson will guide you through the process of adding, editing, and deleting items from the Health Office Log on the Student Health Profile. 1. Click on the Heath tab. To Add a visit to the log, select the Add button at the bottom of the widget. 1. Logged Date- Date of visit, this will default to the current date. 4. Reason- Select a reason for visit from the dropdown menu. This will vary by district. 5. 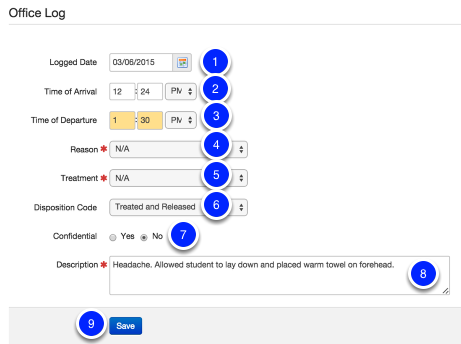 Treatment- Select the treatment given during the visit from the dropdown menu. This will vary by district. Note: The Health code tables (for "Reason" and "Treatment") are available and editable in Code Management. See Screenshot below. 6. Disposition Code- Classroom, Sent Home, Hospitalized, Emergency Care Summoned, Treated and Released. 7. Confidential- Is this visit confidential in nature? Yes or No. 8. Description- Write a short description of the visit. 9. Click Save when finished. The Codes for Health Log Reason and Health Log Treatment can be added in Admin Gear > Code Management. See the help document here. You will receive a 'Data saved successfully' message at the top of the page and be directed back to the main Health Office Log page. To edit a visit-select the pencil icon, to delete-select the trash can icon, and to add another visit-click Add at the bottom of the page.